Back in 2012, after Atlanta bested thirteen other cities in a contest to house 100 homeless veterans in 100 days, Mayor Kasim Reed announced that the city would do even better in 2013 by helping 800 chronically homeless Atlantans—a significant percentage of whom are veterans—move into permanent homes by the end of the year. As of late September, the Unsheltered No More Initiative was on its way to meeting that goal, with 700 people moved off the street. Unsheltered is the first step in a more ambitious plan to coordinate Atlanta’s nonprofit and government organizations (which don’t have the smoothest track record of collaborating on this issue) to eliminate chronic and veteran homelessness by 2015. Nightly about 2,400 people sleep on Atlanta’s streets, and another 2,500 stay in shelters. 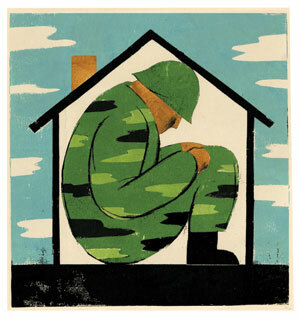 Nationally, some 62,600 former members of the military are without homes, according to the National Coalition for Homeless Veterans, which says that many of these veterans have post­traumatic stress disorder or substance abuse problems. Others have found it particularly difficult to get civilian jobs. Established through a $3.3 million grant from Bloomberg Philanthropies, Wilson’s group serves as city hall’s liaison to nonprofits and state and federal programs. One of their first projects was eliminating red tape in the VA’s Section 8 housing program. Wilson says they reduced the time it takes to move a qualified veteran into a house from 166 days to ninety-five. Once in a home, veterans receive what Wilson calls “wrap-around case management.” Delivered by the VA and its partner nonprofits, this can include everything from job training and substance abuse counseling to dealing with disability and medical issues, an approach Wilson says has kept recidivism in the single digits. PACE Inc. Provides transitional residences, counseling, and support services, with a focus on veterans. Unsheltered No More Coordinated through city hall to end chronic homelessness, particularly among veterans. Veterans Empowerment Organization of Georgia Provides transitional and permanent housing services for homeless veterans on-site in southwest Atlanta, as well as counseling and support services. This article originally appeared in our November 2013 issue.